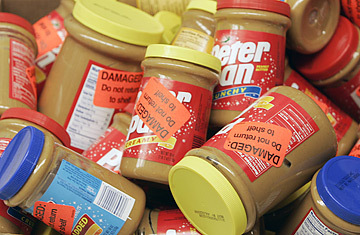 Returned jars of Peter Pan Peanut Butter are shown at a super market, Friday, Feb. 16, 2007 in Atlanta. Who knew peanut butter could pack such a punch? And how do you get rid of all of it anyway? The CDC has now confirmed that peanut butter is the culprit in a rash of salmonella cases nationwide, totaling 329 reported cases in 41 states. While the FDA has not attributed any deaths thus far to the peanut butter infestation, at least two wrongful death lawsuits are already in the works. On Thursday a University of Iowa lab announced the first finding of salmonella in an open jar of peanut butter. The jar had been provided by an infected patient. Experts say it's the first time in U.S. history that peanut butter has been linked to a salmonella outbreak. ConAgra, the Nebraska-based food conglomerate, quickly recalled its Peter Pan brand, which the FDA identified as the source of the problem. "We are truly sorry for any harm that our peanut butter products may have caused," said CEO Gary Rodkin, apparently referring to the severe diarrhea, fever and abdominal cramps consumers suffered for up to a week after infection. The first cases were reported in August, but 60% have arisen since the beginning of December. The manufacturer responsible for such culinary legends as Chef Boyardee, Reddi-Wip, Swiss Miss and Slim Jim is racing to retrieve and incinerate the polluted peanut spread as quickly as it can. It has advised consumers to throw out any remaining Peter Pan in their kitchen cabinets, but it is also busy retrieving unsold jars from major retailers. The company refused to confirm whether it would actually incinerate all the offending peanut butter that is returned or still at the plant; there is also a provision from the FDA that allows ConAgra to irreparably "damage" or crush the jars and then dispose of them. In addition to shutting down production and disposing of existing jars, the company is cooperating with the FDA's inspection of the plant to figure out what went wrong. "A little deposit of salmonella growing inside a piece of equipment may have oozed out a bit of bacterial goop into the product," says David Acheson, Chief Medical Officer for the FDA's Center for Food Safety. He said that during the initial investigation of the outbreak, researchers considered  and ultimately rejected  the possibility that the outbreak stemmed from infected turkey meat or bananas, both of which were among foods eaten by a number of those infected with salmonella. The recall process will take a $50 to $60 million bite out of the company's bottom line this quarter, the company announced. ConAgra says it has long tested 60 to 80 jars of peanut butter a day at the Sylvester, Georgia plant where it produces peanut butter, but never observed anything irregular. The plant is now on hold, while its 100 employees work maintenance shifts and wait for the results of the FDA's investigation. Nationwide, Americans consume almost a billion pounds of peanut butter annually, though that number may drop now that Peter Pan is in Neverland. But ConAgra's problems amount to more than peanuts. The company is also recalling more than 400,000 pounds of Banquet-brand pasta and meatball meals that may have been undercooked. (Consumers were warned, on a hotline, to look out for leaking, bulging, or rusting products, or those with a foul odor). To revive the momentum of another of its brands, ConAgra is bringing Orville Redenbacher back to life in a series of ads recreating the bow-tied popcorn magnate digitally. It can only hope that campaign has some residual effect on its sister brand, helping bring it back in time before it got in this sticky situation.